The phrase 'mobile-first' is one that many sites are using, but what does it mean for news? In a series of features, Journalism.co.uk takes a look at three news outlets which describe themselves as mobile-first. 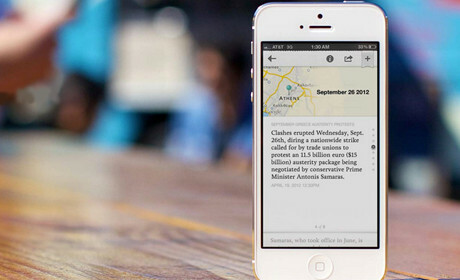 Here we focus on Circa, an iPhone news app. In following features we will also look at Breaking News, which started out as the @BreakingNews Twitter feed and is now switching focus from social to mobile, and Metro, which announced its mobile-first strategy at the end of last year. Circa is a mobile-only news operation that has re-imagined the news story not as an article but as a series of key facts, pictures, maps and quotes. It calls these the "atomic elements" of a story. Users of the iPhone app, which launched in October, can follow stories, getting notifications when there is a key update. The best way to find out how Circa is different is to download the app. "Circa has a few things that are different," David Cohn, the news outlets director of news, told Journalism.co.uk. "The first is that we are a mobile-first news entity. We are producing content that is designed to be read on the mobile first and foremost. We also try and do elements of curation. And we like to joke that the most powerful don't actually read the news they are sort of briefed on it. We try and brief people on the news." He added: "We don't summarise but we do try and hit just the highlights of a news story. The way we do that is we break down news articles into what we call atomic elements, facts, quotes, stats, events, images, and we strip out everything that we would consider fluff or opinion." Circa allows you to follow a story. The first time you click follow you will be asked to provide your email address. When you are following a story you will get a push notification with updates. You can follow stories on Circa "in the same way as you might follow a Facebook or Twitter account", Cohn said. "As new facts or new quotes come out, you'll get those updates and you'll go directly to the newest information. "In this way we can respect what readers do or don't know, what they have or haven't read. So someone who is following a story we will treat differently than someone who is brand new to a story and maybe needs background information." As with other mobile-first apps and news sites, Circa is designed to be read on the move. "A lot of thought goes into the product and the design and to make sure it's not too chock filled," Cohn said. "We don't want to stuff it with everything. "We really wanted to launch with a minimal viable product, something that we could get out there that felt right that did all the things that we wanted it to do, but that didn't bother people with all the things that we don't need." The team started by "thinking about what a reading experience is like on a mobile phone". "The reading experience that we are looking for is not desktop, the screen is relatively defined, we know that it is a matter of inches, and the reading experience of where someone is is very different. "It is someone who is standing in line, someone who is on the metro or a bus. Those are the kinds of experiences that we keep in mind when we are thinking about where people are going to be consuming this and what we want their experience to be like." "We don't write articles, we tell stories," Cohen said. "It might seem like a small distinction, but it's actually rather big because as stories unfold over several days, they evolve and we don't write new articles, we just add new elements." He said that it is not a liveblog with frequent updates. "We only want to bother people or push new facts or quotes to a story if it's important, if it pushes the story forward. We are looking for real movement in the story." And as some stories are interconnected, it can be hard for a Circa journalist to decide when a story starts and stops. "We are basically trying to model the world through stories. And that can be very difficult." Circa has a custom-built CMS "which we lovingly call KPS, or Knowledge Publishing System", Cohn told me. "It is completely built from the ground up and is constantly improving, but in truth there was no CMS that could do what we wanted, because what we wanted to do was so different. CMSs are built round the idea of articles and a box. And we really wanted to think outside of articles." Cohn explained that having worked for desktop sites, he was used to a weekend lull in traffic. "That does not appear to be the case with Circa," he said. "We see a small dip in traffic at the weekends but not in the same way as I would see on desktop websites." "I suspect it's because people's phones are always with them and it doesn't have the same mental overhead of going onto a computer. People don't want to go to desktop websites because once you've opened your computer the next thing you know you are checking you email and you are working. The phone can sort of compartmentalise and people can just check what they want." Circa is currently only available as a native iPhone app. Cohn said they get a lot of requests for an Android version. "There's no timetable for it but it's definitely in our sights," he said, adding that they are considering an approach for iPad. Circa is currently focussing on creating a great product rather than on income. So how does Circa plan to make money? "I think there are a lot of different ways that we can do monetisation down the line," Cohn said. "The one that I think is the most interesting to me personally – this is me speaking personally and not the company – when I look at what native advertising is doing. "In truth I just think they are advertorials just with a new name, like what BuzzFeed is doing, like The Atlantic. I think that is something that is not off the table certainly for Circa." For more on mobile-first and Circa listen to this podcast.